A trio of Links: On the left – the original Link of January 1970. Centre – the cover had changed by the 1980s to depict different aspects of the two villages. The last Link on the right shows the most recent edition: March 2016. The cover now has photographic images. Sitting in the Archive room in the Village Hall one Monday afternoon, I heard the lift rumble into action. Keen to meet the visitor I went into the corridor to be met by ‘Link’ editor, Carole Green, trundling a wheelbarrow towards me containing a heavy-looking cardboard box. Carole had found a long-lost collection of early editions of ‘Link’, the parish magazine. Delving into Carole’s box I found the very first issue of ‘Link’ dated January 1970, price 6d. Until relatively recent times, the Bishopthorpe vicars took on the mantle of editor. In this role, Rev. 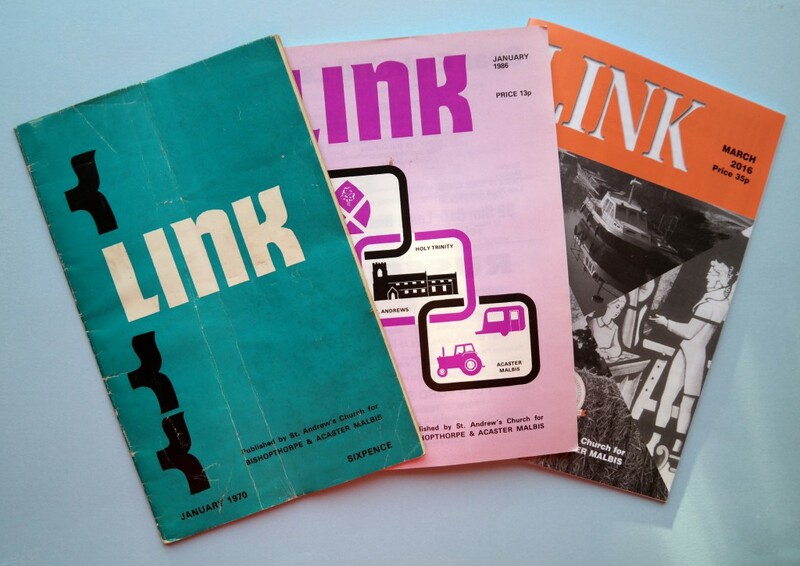 Canon Mark Green launched ‘Link’ in 1970 by distributing a free copy to every family in Bishopthorpe and Acaster Malbis. Prior to the appearance of ‘Link’, the content of earlier parish magazines had contained whatever the vicar decided to write about. Hoping to reach a wider audience Mark Green presented something new with ‘Link’. He explained that the aim of the magazine – and the reason for its title – was to link the many organisations of the two villages. ‘Link’ was a church magazine but he wanted to tread a line between religious and secular content. The parishioners were encouraged to contribute to the publication and, if they disagreed with the views expressed, they should write in and say so. This fresh approach certainly produced results. During the 1960s, the building of the Bradley Estate to the west of Acaster Lane had seen the population of Bishopthorpe more than double in size. Canon Green was aware that long-established villagers had not always welcomed the village expansion but “made the best of it.” Enthusiastic newcomers formed a very active Community Association and a page in ‘Link’ was devoted to this organisation. Some views that were aired in the magazine irritated a number of people and, as Canon Green said, “they gave the impression that life here began in 1965 and that new brooms were sweeping clean.” However, in his editorials, the vicar dealt with this and other controversial matters as they occurred, with equal fairness. As 1970 progressed, the folk of Bishopthorpe and Acaster were busy with many aspects of village life. For example, the Parent – Teacher Association was concerned about the “chaotic traffic situation in Copmanthorpe Lane, particularly in the afternoon when children are leaving school.” Sound familiar? The most exciting venture was the sixth production of the Pageant at Bishopthorpe Palace. Some of the funds raised went towards a much-needed new heating system for the Village Hall. A smaller sum was given to the Junior School for its project to build a swimming pool. In wheelbarrowing the lost ‘Links’ into the Archive, Carole added to an almost complete run of the magazine from its inception in 1970 through to 2016. For that period, only one copy is missing – May 1985. So, if anyone has that issue we would be pleased to add it to our collection.